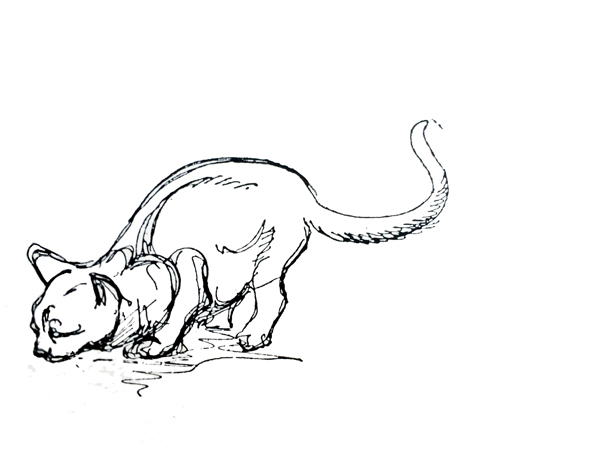 An illustration by B. Whistler Dabney for Pati Hill’s essay “Cats,” from our ninth issue. The Paris Review was saddened to learn that Pati Hill, a frequent contributor and longtime friend of the magazine, died last Friday at ninety-three. A native of Kentucky, Hill worked during the forties and fifties as a model in France, where she was part of the same community of expats that included George Plimpton and the founders of the Review. Over the years, beginning with our second issue, Hill published six stories and an essay with the Review; her last contribution, part of a series of sketches, came in Spring 1981. She wrote a pair of well-regarded books—a novel and a memoir—in the fifties, but today she’s probably best known for her art, which made early and innovative use of an IBM photocopier, as an obituary in the Times says.